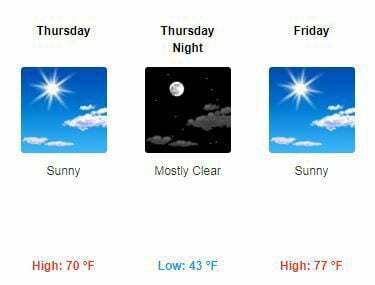 ELKO – Northeastern Nevada’s warmest day yet in 2019 is expected to arrive near the end of this week. Temperatures will climb into the mid to upper 70s on Friday, according to the National Weather Service. The high in Elko has not reached 70 degrees since Oct. 28 — nearly six months ago. Elko could see three dry days in a row this week after showers move out of the region by Tuesday night. That would be the driest period since mid-March. Elko has nearly received its annual quota of precipitation already this water year. Another half-inch or so will bring the total past 9.91 inches with more than five months remaining in the water year that began Oct. 1. The warmer, drier forecast was welcome news in this part of the state but the timing could be better. Cooler, wet weather is expected to return Saturday and Sunday with highs in the mid-60s. The weather service is calling for a chance of rain and snow showers on Sunday.